Sam and Starla live with four cats in a very rural area near Brookhaven, Mississippi. One of these cats is a mostly-black female which they adopted from a neighbor and named Bella. 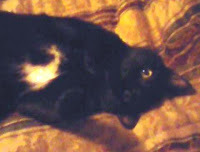 Bella has some small white patches on her chest and belly and is just over two years old. We don't know what happened, but for whatever reason, Bella climbed a pine tree down the road and got stuck, and it took a day for Sam to find her. Sam called a local animal welfare organization that happened to have a flyer on their bulletin board for the only cat-in-tree rescuer in the whole state of Mississippi, Bob Reese. Sam called Bob, but Bob was a three-hour drive away, and by the time he got there, it would be getting dark. Bob is a good friend of mine, so he called me to see if I would be interested in handling this case, especially since it would be only a two-hour drive for me. I accepted, quickly packed up and rushed out the door. When I arrived, I met Sam, and he took me down the road a bit to show me where Bella was. 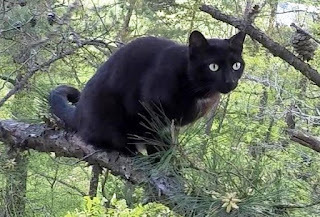 There I found Bella perched 40 feet high in a pine tree next to the road. The tree was just on the edge of a wooded area, and there were a fence and several trees close by that hindered my access around the tree. I found a tight opening where I could shoot my line through the branches of the adjacent tree and reach a suitable branch above Bella. I was watching and listening to Bella to gauge how she would react to the noise and activity of my rope installation process, and she seemed to remain calm the whole time. When I began to climb up toward her, I watched her reaction to see if she would be afraid of me, and I was very relieved to see that she appeared to be happy to see me. 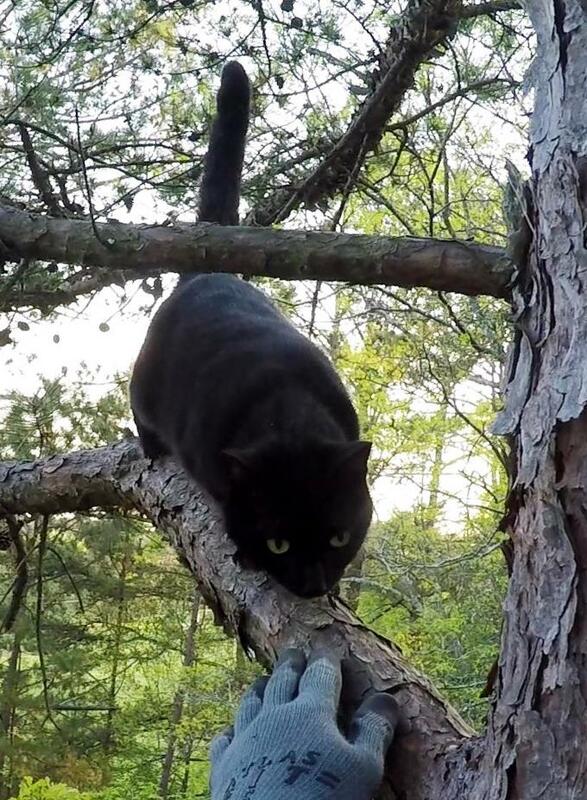 As I climbed up close to her, she walked toward me from her perch out on the branch to greet me. I was very happy to see that. I raised my hand up to her, and she sniffed it and seemed to be satisfied. But then she seemed to have second thoughts and turned around to walk away from me. I called her back and extended my hand to her again. She came back and sniffed it more thoroughly this time, and, again, she seemed comfortable. I don't know what caused Bella to change her mind, but change it she did. She walked far out to the end of her branch and perched there where she felt a safe distance from me. I pulled myself up a little higher and then opened a can of food. That got her attention, and she decided she might like me after all. She walked back toward me and sniffed the food. Strangely, she did not eat any food. Maybe she didn't like that flavor, but she did seem interested in sniffing it. While she was close, I extended my hand to touch her, and she was receptive. 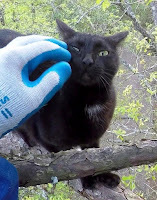 She seemed to enjoy the touch and petting, and it appeared we had made friends with each other. Since we were now friends, I decided to get prepared to bag her. But Bella changed her mind again. Again, I don't know why Bella did so, but she turned around and walked all the way back out to the end of the branch. I gave her a few minutes to settle down, and then I offered her the food again even though she did not seem interested in eating it. Fortunately, that worked again. She may not be interested in eating the food, but she sure did seem interested in sniffing it. Perhaps she was hoping it would be a different flavor this time. Bella returned all the way back to me again, and I gave her some more petting and scratching, all of which she enjoyed. When I was ready, I picked her up by the scruff and began to pull the bag over her. Bella found another branch to grab with her front legs, but I pulled them loose and pulled the bag over her. She protested and struggled a little bit, but I easily secured her in the bag and brought her down. I handed her to Sam, and he took her home where she filled her belly and settled in to enjoy the comforts of home.